Water coming from the soil will have various dissolved Nitrates, Chlorides and other salts (hygroscopic ground salts) which will be carried upwards into the brickwork and plaster. As the water evaporates, an increasing amount of these salts will be deposited in the wall. As ground salts are easily dissolved they also readily attract moisture from the atmosphere. As a result of this the plaster will always be damp or contaminated, even after the rising damp is cured. For this reason the plaster is normally removed when treating rising damp. Wood rot in adjacent timbers may often be as a result of rising damp in a wall. moisture to enter the structure in a horizontal direction. Gravity may cause the downward movement of the resulting dampness. 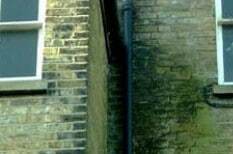 Causes of penetrating damp may be from sources difficult to control such as defective brickwork, cracked render, faulty pointing, poor flashings or rainwater goods. The cause can also emanate from a defect within an adjacent property outside the owners control. 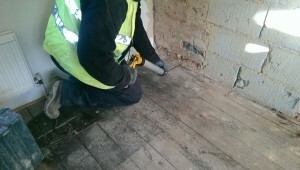 The installation of the damp-proof course will prevent further rising dampness. However, water attractive hygroscopic salts, transmitted by the rising dampness from the soil to the brickwork will continue to attract moisture, particularly during periods of high humidity. Where this occurs to an unacceptable degree, re-plastering to the PTL specification is required. PTL employs specialist plasterers and would be pleased to provide quotations for this work. Contact us today to arrange for a survey, and one of our surveyors will provide you with a report and quotation outlining what is causing the damp and what the best solution is.